Our introduction to genealogy typically begins in grade school, when we’re tasked with tracing our family heritage on a large poster board, crafting a family tree, and going back generations until the information is depleted. For some, this discovery process sparks up again later in life as people embark on a quest to find their place in the world in the context of family. With the ease of online research revolutionizing the craft, genealogy has become a popular hobby. Wilfrid Laurier University’s Archives has been playing a central role, as people from all over the world who are yearning to satisfy a desire for connection with their ancestors have involved the archives in their pursuit. After starting their search online, genealogists get hooked on what they find, and many make their way to the Laurier Archives in Laurier’s Waterloo campus library to discover artefacts showcasing their family heritage. There, pieces of history are nestled away in a climate-controlled and fire-safe room, preserved for both genealogical and scholarly research. Of particular interest to genealogists, the Laurier Archives is the official repository of the historic records of the Evangelical Lutheran Church in Canada. Laurier’s Lutheran Church archives contain close to 400 linear meters of records, which date from the mid-nineteenth century. The collection includes church records, correspondence, historical documents, meeting minutes, photographs and publications of church organizations, congregations and pastors. The Laurier Archives team welcomes those eager to learn the heritage of Lutheran families. But finding what they’re looking for can be time-consuming and challenging. The earliest Lutheran congregational materials often were not documented in English and were written in now-unfamiliar handwriting. The cursive style often changed every couple of years as a new secretary took over record-keeping duties. 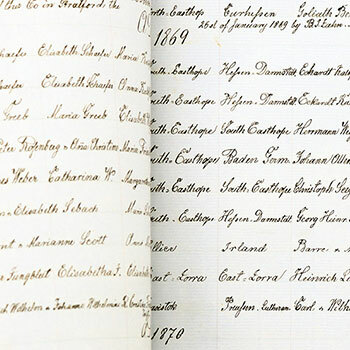 To be able to transcribe materials and spot a specific name or date is an impressive skill. In North America, immigration is a particular point of interest for genealogists, especially for those several generations removed from the immigrant experience. Notably, the most unique aspect of the Lutheran collection at Laurier is how it offers an interesting and often unseen glimpse into life for immigrants in Canada in the late eighteenth century and early- to mid-nineteenth century. Many early Lutheran congregations in Canada were made up of immigrants from Europe, including newcomers from Germany, Norway and Latvia. During the immigration process, family names could have been altered or changed. This is another point of interest for genealogists coming to Laurier. “Some people come looking to confirm their family’s last name,” says Furlong. As the church was part of everyday life for many people, the records it collected are eye-opening and information-loaded pieces of history, now preserved for succeeding generations. The Lutheran collection is an important source of genealogical information – documenting marriages, deaths, births, baptisms and burials – particularly for years prior to the beginning of civil registration. But it also tells a more intriguing story. Records like these can also illuminate family and communal life, as well as demonstrate the role of women in church proceedings. “These records help genealogists discover what life was like for their ancestors. They show the story of how people lived, how they contributed to their community, or simply the political and social nature of the times,” says Furlong. The Lutheran collection is brimming with documented connections that can bring families together on deeper level — one that goes beyond simple statistics. “It’s important for us to archive records from the Lutheran Church, as this is the community in which Laurier started,” says Julia Hendry, head of archives and special collections at Laurier. Laurier and the Lutheran community’s deep, longstanding relationship dates back to 1911, when the university was first established by the Evangelical Lutheran Synod and known as Evangelical Lutheran Seminary of Canada. The records represent the legacy of the university’s foundation. “Housing this collection is one way to give back to the community where we have roots,” says Hendry.